Since its creation in 2009, PhilPapers has quietly become a leading research tool for scholars and students in philosophy. In essence it is a research database, and the main competitor for The Philosopher’s Index, but it’s also an open access archive and a discussion forum for the philosophical community. Since absorbing the content from the Philosophy Research Index back in April it also claims to be the largest research database in philosophy, with more than 1.7 million entries from some 4,600 journals. Much of its content is sourced by crawling the sites of journals and open-access archives, as well as member submissions. PhilPapers grew out of MindPapers, a philosophy of mind bibliography created by David Chalmers in the mid 1990s. Today it is edited by Chalmers and David Bourget, along with an array of area editors, and is operated by the Philosophy Documentation Center and the Center for Digital Philosophy. It has been sponsored by a number of institutes and organizations, including the UK’s Joint Information Systems Committee (JISC) and the philosophical profession’s main scholarly society, the APA. Built with internet-based research in mind, PhilPapers is less clunky and more connected than most databases. 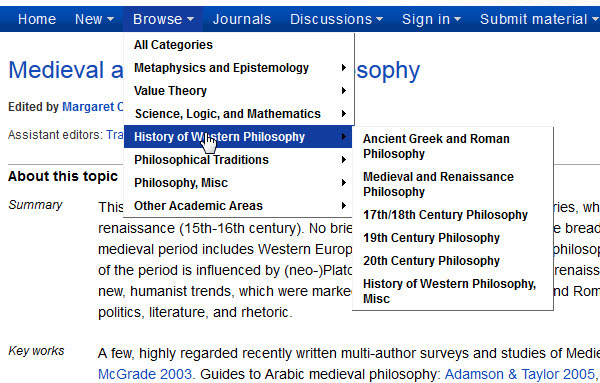 The search function is complemented by the ability to browse a finely articulated taxonomy of philosophical topics and areas, each portion of which is curated by scholars with appropriate expertise. Navigating from the general area “History of Western Philosophy” to “Medieval and Renaissance Philosophy,” for instance, one finds a brief overview of the topic along with a list of key works before being presented with a breakdown of further subcategories. The PhilPapers platform includes an array of useful features, including the ability to set up content alerts for the topics and subtopics that interest you, as well as specific searches. Users can follow authors, save articles to bibliographies and reading lists, and export citations to citation management tools like Zotero and Mendeley. Other features, like links to an article’s Google Scholar page, or to cheap copies of a book on Amazon, help to integrate common next-steps in the researcher’s workflow. To learn more about PhilPapers, or if you have questions, please contact the Philosophy Liaison Librarian Nikolaus Fogle (nikolaus.fogle@villanova.edu, 610-519-5182).